A nice day for Sam involves arriving at the library when it opens, favorite drink in hand (coffee or hot chocolate), and spending the day reading with a break for lunch and dinner. But – a really, really nice day includes the addition of a visit to the local conservatory with a large indoor botanical garden, conveniently located near his favorite library. Sam loves to read, and prefers non-fiction about mythology, culture, social issues and biology/ecology. He has always had an interest in Australia and loves to read about the natural history of the continent as well as its social history. At the conservatory, Sam’s favorite rooms include the traditional courtyard garden with its pleasing symmetry, and a recent display that mimicked an Australian scrubland. Sometimes these outings, and others, are not easy for Sam. Sam is autistic, and also has OCD and anxiety. “When I think too much about all of the things I would like to do and how some of that is limited by being autistic, I do get kind of sad and frustrated. I particularly hate when I am excited about doing something and I have to cancel it or leave early because I am getting overwhelmed and upset,” say Sam. 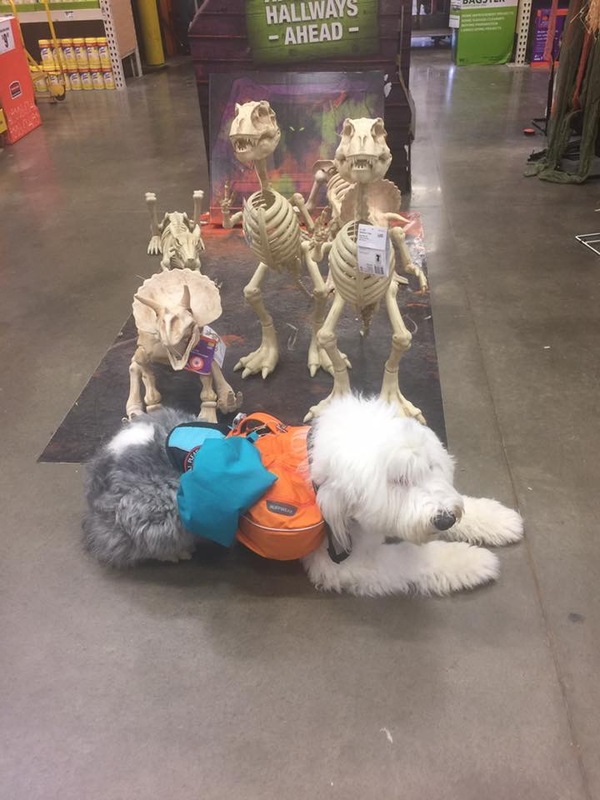 Clover sporting her new backpack on an outing to a store around Halloween. But recently Sam has been making great strides in his quest for independence. 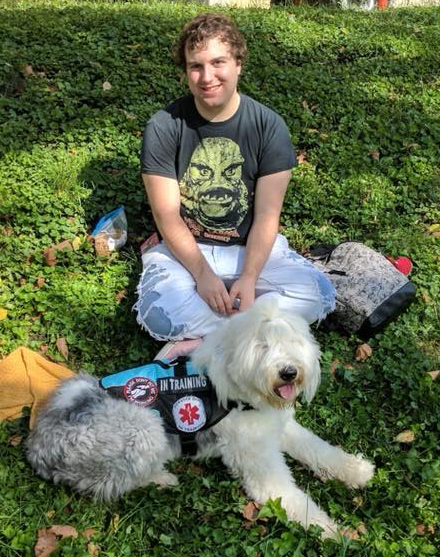 He began training his own service dog, Clover, a year and a half ago, after learning about all the things a service dog can be trained to do. “It’s like having a helpful friend with you all the time but you know you aren’t bothering them and they don’t have things they’d rather be doing than helping you,” Sam explains. Clover helps Sam in a number of ways, from alerting Sam to sounds like his name being called or his phone ringing (it can be hard for him to process these things when he’s beginning to feel overwhelmed) to providing deep pressure therapy where she leans or drapes part of her body over his (similar to the effect of a weighted blanket). While a service dog and its training are not covered under the federal definition of assistive technology, all of the gear that supports Sam using Clover is. The primary equipment Sam wanted was a backpack for Clover. “My doctor suggested that I keep it packed and hanging in the same spot so that when I am getting ready to go out somewhere, I don’t have to think about all of the things I need to feel prepared to be somewhere alone. 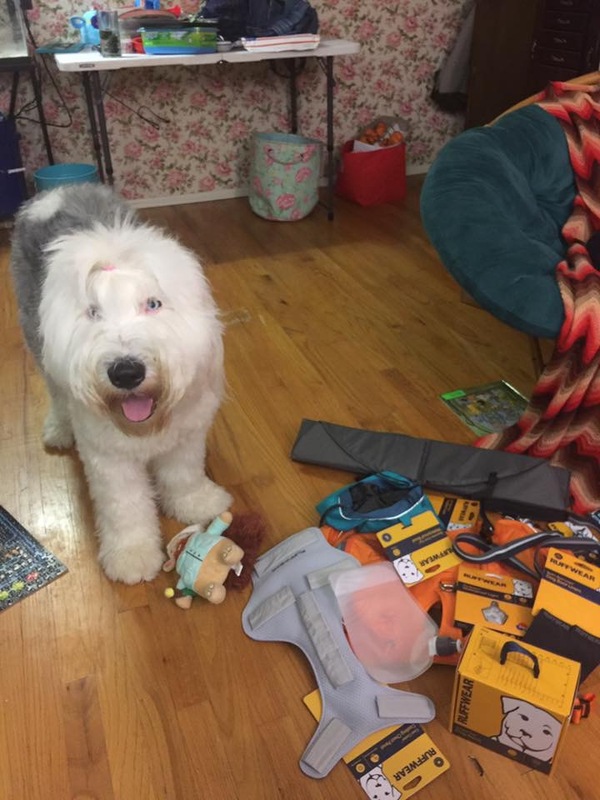 Now she carries things like her potty bags, my medications, her treats and usually enough food for one meal for her, an extra cell phone charger, and other things I might need,” says Sam. Clover poses with her favorite squirrel toy next to all her new equipment. A lightweight, portable dog bed. Being able to simultaneously build his credit, was an unintended extra benefit. PATF Mini-Loans for assistive technology purchases under $2,000 have zero fees, 0% interest, and low monthly payments. Learn more about our Mini-Loan program and whether it’s a good fit for you. Read how borrowers are using their assistive technology to live their lives.